The Master Builders Hotel at Bucklers Hard is on the Beaulieu River only minutes drive from the picturesque Beaulieu River and acclaimed National Motor Museum. It is actually the old home of the master builder who owned the company that made Ships of the Line who fought in the Battle of Trafalgar. There is an iconic wide street of period houses leading down to the river which can be great for photographs but be warned that this area is open to the public and can be full of “muggles” during the Summer. Down on the riverside is beautiful but looks best in the Summer when the leaves are back on the trees and blue sky is reflected in the water. The venue itself is oozing with historic and maritime character it is very cozy, especially in the Winter with the small of wood smoke from the gorgeous fireplace in the wonderfully “cottagy” lounge. The garden of the venue looks very pretty and slopes away down to the river’s edge but this slope does restrict the number of level-ground places in the garden you could have group shots and if there weather was poor there are not many indoor options for large groups. For smaller weddings this venue would be lovely with lots of options in all weathers. For larger weddings it is an exceptional historic venue with a difference provided the weather is fine enough for guests to spill out onto the gorgeous garden, iconic historic street and riverside. 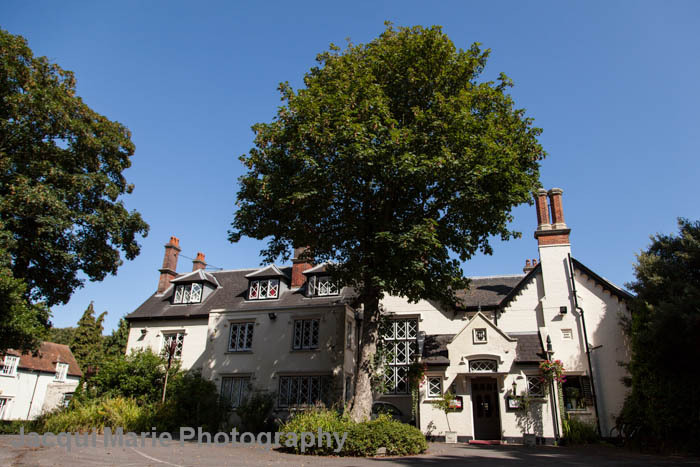 The East Close Hotel is a lovely wedding venue situated to the south-west of Lyndhurst in the New Forest on the A35. It’s period interiors are sumptuous and done with great style. Inside there’s a gorgeous staircase and various rooms with mirrors and sofas and Georgian windows. It’s a lovely place to spend time. Out the back of the hotel is a wonderfully spacious and open garden adorned with hay bales and what look like beds that your guests can sit on. There’s also a patio with patio-furniture and the whole place has relaxed and calm ambience. East Close will do both your ceremony and reception if you wish and the staff are fantastic to work with and the food is magnificent. Bridal prep facilities are spacious and beautifully decorated & furnished. The ceremony is in one of the rooms inside the hotel and reception is in the marquee in the garden. The marquee itself is nicely draped and is light and spacious. We’d thoroughly recommend East Close Hotel for a Summer wedding because of it’s lovely garden, relaxed ambience and spacious marquee. We’ve not photographed a Winter wedding at East Close yet but imagine it would be a lovely venue for a Winter Wedding too because of its gorgeous interiors. It’s possible that the maximum size of a Winter Wedding might be smaller if they’re not using the marquee but well worth ringing them up and enquiring. If you want a stylish and period feel to your wedding venue, great food and wonderful staff to work with then we strongly recommend you makes some enquiries at the East Close Hotel. 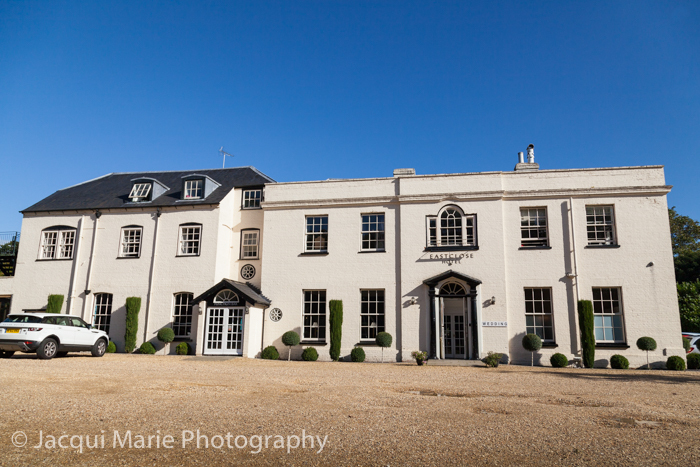 If you want your entire day or maybe just the reception and evening party at a quality venue in the New Forest, then this venue might be for you. We understand they will take bookings for weddings for any day except Tuesdays, so there may even be some discounts available for a mid-week wedding. One final point of note is that we understand they have been doing six weddings a week over the Summer and will continue to do so on into the Autumn so it sounds popular and if you’re thinking about booking East Close Hotel for your wedding our advice is that you try and book early. The Concorde Club in Eastleigh near Southampton has three different wedding room options for different wedding requirements. Extra to that they have a wonderful marquee in their tranquil garden. We have only have experience of the marquee wedding option, so that’s the only one we’ll be reviewing here. It is a lovely marquee set in a large tree-lined grass garden with outside chairs and tables. Access to the marquee is over the grass so it might not be ideal if there had be enough rain recently to make the grass muddy but for most of the Summer months it shouldn’t be a problem. Once inside the marquee it is spacious and beautifully decorated with ceiling and side wall drapes. The whole of one side of the marquee is “windowed” out onto the garden and makes for a very open light and airy feel. At one end of the marquee is where the caterers serve from and at the other end is the dance floor for the evening and round tables for the guests in between. There is plenty of room inside the marquee for a DJ, and a band, and a photo booth, and a chocolate fountain, and a sweetie table...whatever you can think of. The staff are lovely and very accommodating. We’ve been at a wedding there where the staff have been happy for the wedding cars to come onto the grass for photographs and later in the evening they’ve been happy for a fire-breathing act to do their thing on the grass in front of the guests. The ambience of the venue is very relaxed an absolutely perfect choice for a Summer wedding if you are interested in a marquee. If not, then perhaps drop them a line and get details of their three “inside the venue” options. The Concorde Club has very easy access to the M27 and plenty of parking. 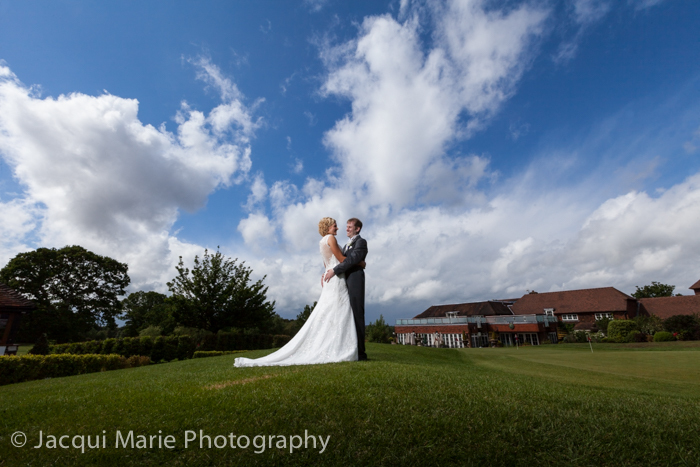 Bartley Lodge Hotel is a fabulous wedding venue. It manages to be both a grand country house with its stunning grounds and fabulous architecture but also in intimate, homely and welcoming venue with its gorgeous and classically elegant interiors. The staff are absolutely brilliant and very accommodating. Whatever it takes to make your wedding perfect! It is very close to the M27 and very easy to get to but is up a long drive way in amongst the trees and is very secluded and quiet and there is plenty of parking. The front of the hotel has a large courtyard style frontage and at the back there is a generous patio and sweeping lawns with trees and lovely view. We recommend this as both a top summer venue (because of its lovely exteriors and gorgeous grounds) but also a top winter venue (because of its wonderful interiors as well as the ample patio which is ideal of high heels even when the grass is soft). The Bartley Lodge Hotel has two rooms licensed for wedding ceremonies. 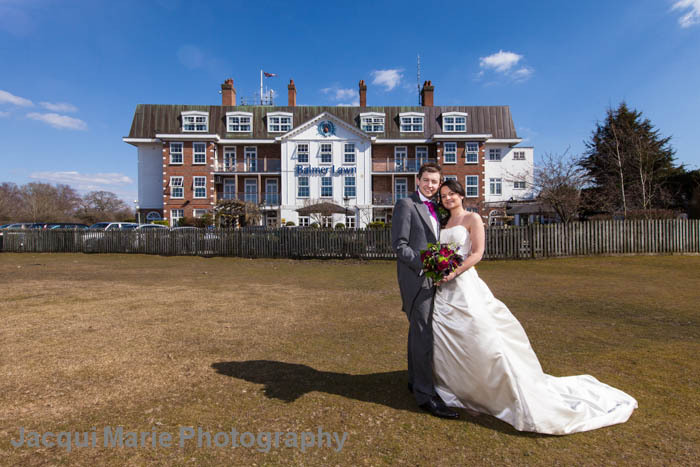 Victoria House is in Hamble near Southampton and is a lovely venue for a wedding reception. It’s outside architecture is breathtaking and the grounds are fabulous with a huge lawn, at the bottom of which is a garden area with trees and shrubs. This makes Victoria House a gorgeous wedding venue for outside photographs and for your guests to have drinks on the patio and spill out onto the lawn. Victoria House was built as part of the British Empire’s flagship military hospital at Netley and oozes the charms of Victorian architecture from when the British Empire was at its height. Inside where the wedding reception tables are laid out is spacious, airy and modern. After the meal it is cleared to make a sizeable dance floor. There is plenty of parking at Victoria House and the staff are very helpful. We would recommend that Victoria House is definitely worth a look if you’re looking for a venue with stunning outdoor photography options and intimate but spacious interiors. 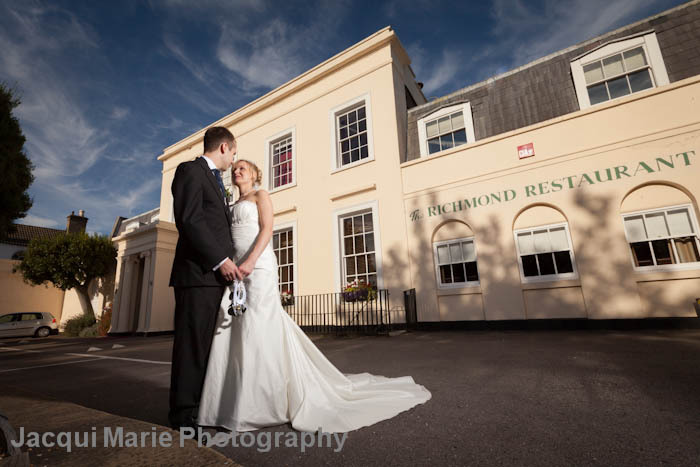 The Lysses Hotel is an intimate wedding venue in Fareham with lovely garden, patio, columned entrance and impressive staircase. Since we last shot a wedding at the Lysses, they have completely re-decorated. The atmosphere at the Lysses is very relaxed and guests naturally spill out onto the patio and into the lounge during the course of the day. There is a large room upstairs and downstairs and it is a matter of preference as to which is used for ceremony and/or reception. When we have been there the staff have been friendly and helpful and accommodating and the food has been gorgeous. Regarding wedding photography location options, the garden is great for group shots with a nicely bordered lawn and steps up to the patio. There is also a fire escape that photographers can climb to shoot down on large groups. The garden has some nice angles for portraits too. Further wedding portrait opportunities include the columned entrance, the staircase and there are also some nice locations in the garden. 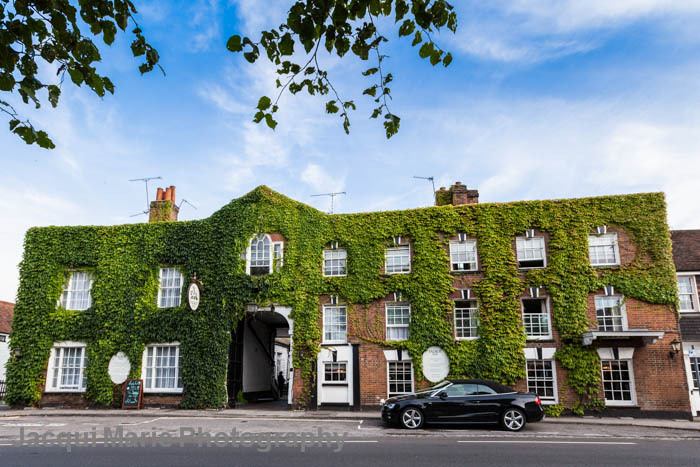 A few steps away from the hotel and you are on the top of the pretty and historic end of Fareham High Street which can also make a fabulous backdrop for portraits. The front of the hotel is striking and and be a great scene-setting backdrop for wedding portraits. Inside there are many large windows shaping light perfectly for natural light portraiture. 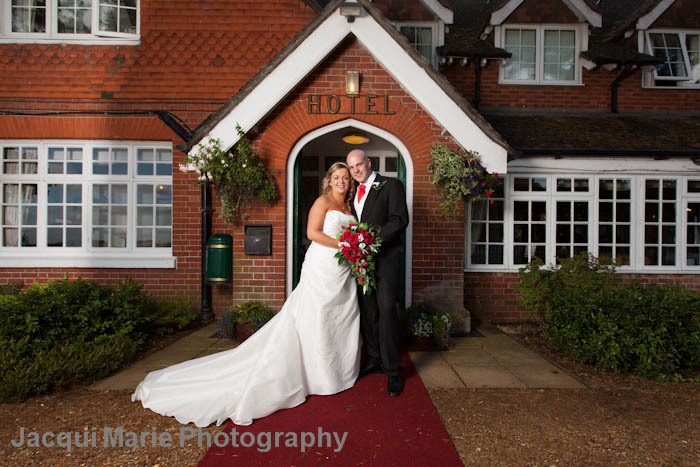 The Lysses Hotel is a gorgeous and intimate wedding venue situated in a pretty part of Fareham. 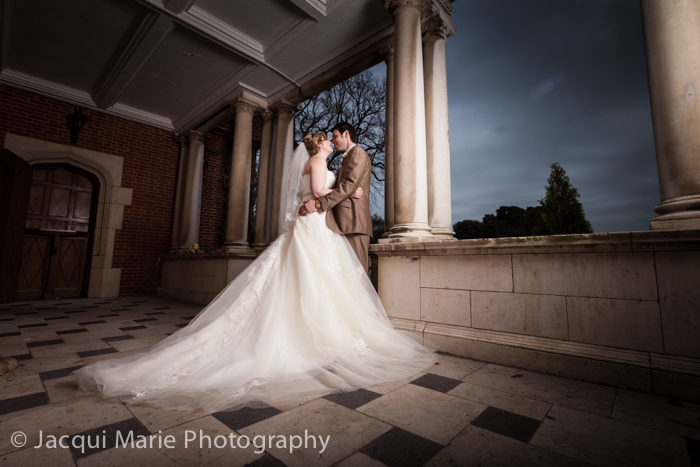 Great staff, great food, lovely relaxed atmosphere and some lovely locations for wedding photography both inside and out. 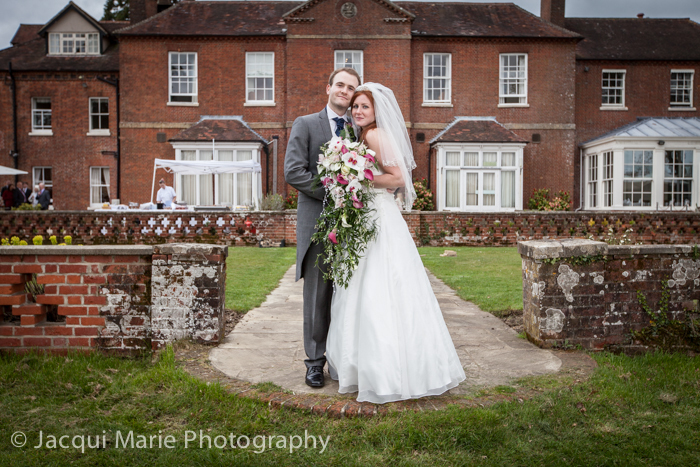 The Beaulieu Hotel is a lovely wedding venue in the New Forest. It is actually a few miles away from Beaulieu village itself and the Motor Museum so look it up on a map before you go so you’re not hacking up and down country lanes trying to find it. It has a very pretty entrance which is red-carpeted for weddings and leads straight to the main road so your transport can drop you there when you Arrive. Opposite the front of the Hotel is a panoramic view of the New Forest which is great for portraits, especially if you have an interesting sky. The Ceremony and Reception are held in the same room which is spacious, nicely decorated and with great light. Because the same room is used for both Ceremony and Reception, your guests need to vacate the room so the hotel staff can turn the room round in between. This is not a big issue because in good weather your guests can go out of the patio doors from the Ceremony room straight into the garden which is very pretty and with plenty of paving slabs (great for high heels if the grass is a little soft). There is also an adjoining room with a bar for your guests to spill out into and it is plenty large enough even if you want a photo booth. Guests are also welcome to spill out into the Hotel’s lounge area. From a photographic point of view, the interior of the Hotel is very pretty, as is the outside architecture. Opposite the Hotel across the road there is a fabulous open and flat-to-the-horizon part of the New Forest and also some tall trees not far away - if the weather is kind, this can be a great place to do a variety of portraits within walking distance from the Hotel. When we’ve been there the staff have been a delight to work with. 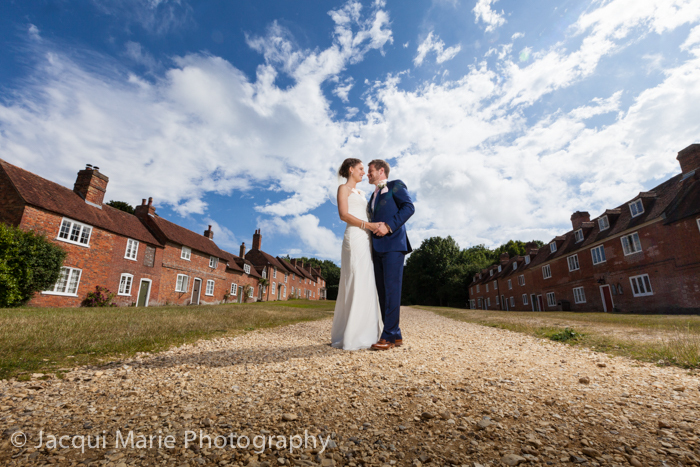 A pretty and intimate venue in the gorgeous New Forest, Hampshire. The Balmer Lawn Hotel has two fine wedding suites, quite some way from each other and with their own gardens. The architecture within the hotel is interesting and photogenic with a staircase, archways and piano in the foyer. The bridal prep room that we have always been in has been fabulous. It is spacious with a four poster bed, large full length mirror, large windows that give gorgeous portrait lighting and a spacious bathroom. Both the bridal suites have lovely decoration and sensible layouts. If time and weather permits a short walk gets you to a beautiful stream which is a fabulous opportunity for portraits. In front of the hotel there is a large lawn which is not only good for daytime portraits against the frontage of the hotel but is also perfect for sunset shots if you’re lucky enough to have one. Because of the Balmer Lawn’s lovely interiors and the gorgeous bridal prep room as well as the wedding suites being made of several rooms with great ambience and outside photographic opportunities with pavements in case of muddy conditions that we rate the Balmer Lawn Hotel as a Top Winter Wedding Venue. Additionally because of the close proximity of the bubbling stream and the lawn in front of the hotel that can give you stunning sunset photography, we also rate the Balmer Lawn as a Top Summer Wedding Venue. Careys Manor Hotel has lovely external architecture and pretty well tended gardens. There is a sweeping pea-shingle drive in front of red-brick victorian architecture including a stepped porch entrances which makes a terrific frame for length bride and groom portraits or even group shots. Across from the driveway is a bordered lawn garden which is not only attractive but has plenty of shaded areas for Summer weddings. Following the drive back towards the road and there is a gated archway in the garden wall which is another great place for romantic portraits. Going on through the gate leads you to an open lawn to the road which is also beautifully tended with trees and borders. Yet another gorgeous place for portraits in the Summer. Stepping just outside of the room used for the Reception leads you a walled patio area which is sheltered and also a pleasant place for group and portrait photography. This is also where they place the hog roast if there is to be one. Guests often spill out into this patio area in Summer weddings during the evening disco. The interiors of Careys Manor are exceptional. The room used for wedding ceremonies is feels intimate but is spacious and is beautifully designed. The room used for the meal is light and airy and great for both Reception/Speech shots as well as spacious enough for a live band and plenty of guests for the evening. The design of the hotel is such that you and your guests can walk from the Ceremony Room, through the Foyer and into the Reception Room without going outside, ideal if the weather was poor. [UPDATE: 1 MAY 2017] Careys now offer outside wedding ceremonies if weather permits. The jewel in the crown of Careys Manor must surely be the interior of the hotel foyer. 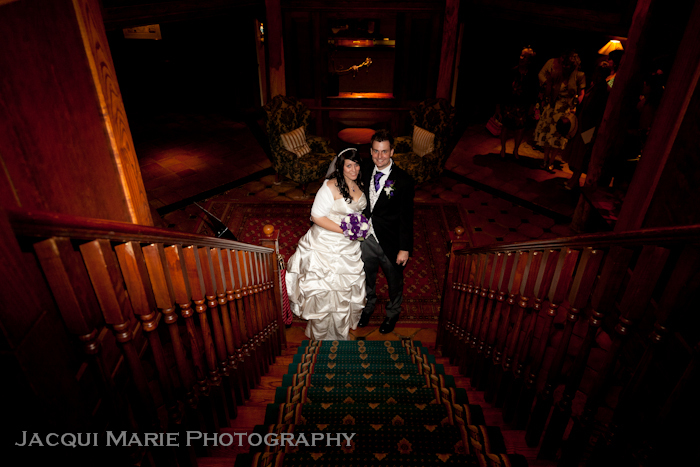 The gorgeous wood panelled Foyer, with its wooden stair case makes for some fantastic wedding photography. It is because of the these varied and pleasant outside wedding photography opportunities as well as its gorgeous interiors that we have rated Careys Manor as both a Top Winter Wedding Venue as well as a Top Summer Wedding Venue. The Hilton at Chilworth (sometimes referred to as the Hilton Chilworth and sometimes as the Hilton Southampton) is easy to get to from the M27 junction 5 at Eastleigh, very close to where the M27 meets the M3 near Southampton. The grounds are modest and one of the nicest features (a little bridge over water) has been blocked off and is now sadly unavailable for wedding photography. Regarding the Hilton’s interiors, the foyer is visually interesting and the main wedding room is beautifully decorated and is very spacious. There are few places for group shots. The back garden is largely grass and on an incline. If the weather has been good and the grass firm and the sun is in the right direction then there are some opportunities for group shots at the back. If the weather is poor there are few options but one of them is at the entrance to the hotel. It is reasonably well sheltered, has flagstones for the high heels and there is a small exotic garden which can provide a pleasing back drop. At the right time of year there are some nice climbing plants with abundant blooms for garden photography and there are wooden columns and a long wooden balcony. In summary, this venue is easy to get to and has plenty of ambience once you get inside with it’s interesting foyer, wide corridor and pleasing spacious main wedding room. It’s photographic opportunities are limited both inside and out so it may be worth considering whether or not you’d like to travel to somewhere nearby for bride and groom portraits - if your timescales and transport arrangements allow. 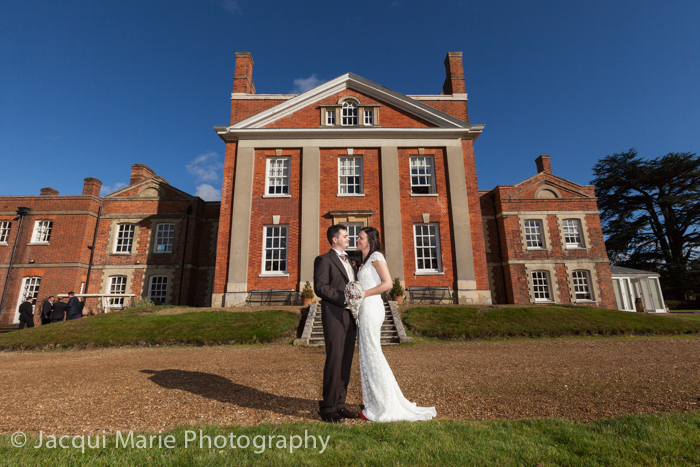 Warbrook House is an excellent wedding venue. It is a large venue with fantastic architecture set in immense grounds with wonderfully elegant interiors and brilliant staff. There is ample parking and it is easy to get to from the M3. The grounds include a long lake, huge lawns, a sunken garden, plenty of trees, a substantial patio out the back and a courtyard at the front. The hotel is licensed for wedding ceremonies so it’s possible to have the entire wedding at Warbrook. If you choose to have bridal prep there, the bridal prep room is stunning. It has lots of space, elegant interiors and includes a conservatory which looks out onto the sunken garden. An amazing way to start your wedding day. It is worth checking with Warbrook what the booking situation is because last time we were there it looked as though they were about to start booking marquee garden weddings too. If, though, you book a House wedding there are many grand and elegant rooms with fantastic windows and ceilings. There are plenty of rooms your guests can spill out into as well as the fantastic grounds to explore. There is obviously a fabulous Summer wedding venue, if you get the right weather it is simply stunning but it is also a beautiful Winter wedding venue. If necessary, there is plenty of room inside for photography against the beautifully elegant interiors but if the weather is dry there is an abundance of gorgeous outside locations where high heels can stand on stone or tarmac if the grass is too soft. And here is our top recommendation regarding booking your wedding at Warbrook. If you are offered Alan Marshall as your Master of Ceremonies, seriously consider taking us this option. More than any other MC we’ve worked with, he works so hard to ensure the smooth running of the day, he introduces elements of wedding tradition throughout the day to help set the tone and, without giving much away because the surprise is the nicest part, he does some set pieces that are very touching have always been well received by the brides and grooms whenever we’ve been there. He really does add a lot of value (and no we’re not on commission). 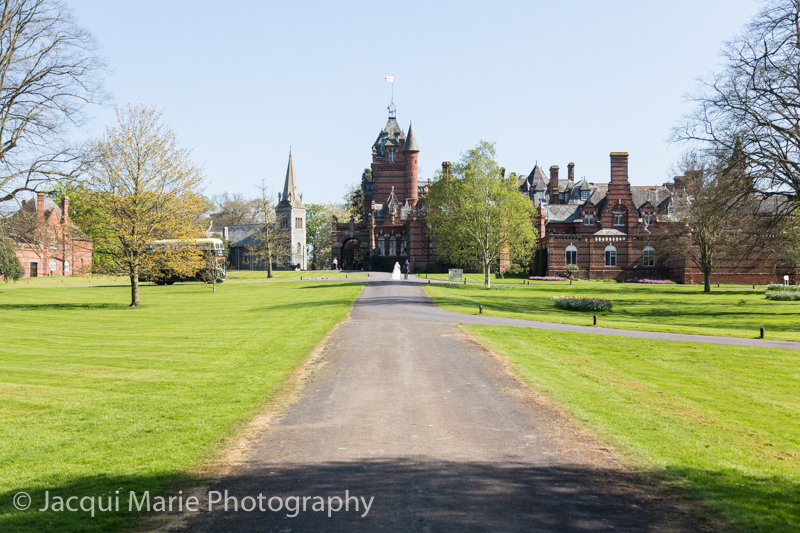 New Place is a wonderfully impressive and historic hotel near Shedfield in Hampshire. The stunning period brick architecture is set off beautifully by the substantial pea-shingle frontage that has a gorgeous iron gateway as its entrance. There are substantial grounds including a patio, wide steps down to the lawn and flowered borders. The interiors and windows are wonderfully period. When we have been there the upstairs room for bridal prep was very spacious with plenty of light though its large windows. 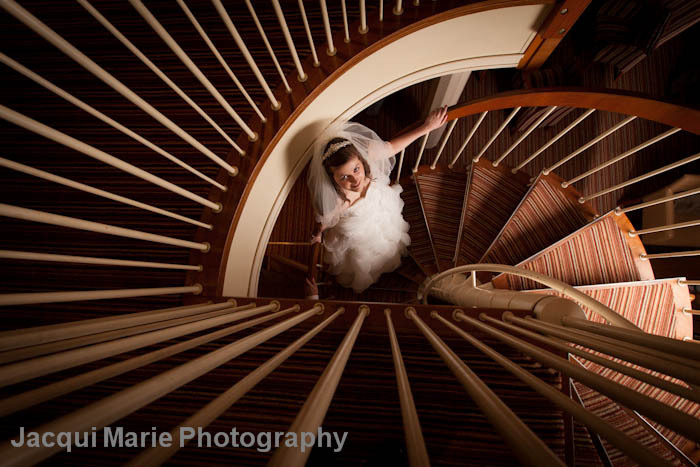 When ready, the bride walks along the long hall upstairs, down the historic staircase, along the picturesque downstairs hall and into a gorgeous ante room where the bridal party forms up before going into the ceremony room. This ante room has a fabulous stone fire place and is ideal for inside photographs both before and after the ceremony. After the ceremony this room is often used for drinks and canapes. If the weather kind, guests can spill out onto the patio for drinks and enjoy the garden. The reception is held in a separate building just along the garden path and down some steps. It is a modern and spacious building with a separate room for the bar. The room for the meal is spacious and is also used for the disco in the evening. From a photographic point of view, there are many opportunities around the garden with its steps and borders, lawn and trees and with the distinctive architecture of New Place in the background. The patio is great for reportage and just off the patio through a arched doorway there is a lovely lawned quad. Out the front of the main building is a large open square pea-shingle drive way which is normally kept free of cars for weddings. This is a great opportunity for photographs. You can have a confetti shot in front of the distinctive arched entrance way to the main building, you can even form a large group and shoot down from an upstairs window. The iron gates opposite the entrance also make a great setting for portraits with the historic New Place building in the background. The garden faces West so as the sun goes down there can be some gorgeous evening sky portrait photography. New Place is a beautiful wedding venue both inside and out. The main building oozes historic character and the reception building is clean and spacious and modern. The garden is fabulous, especially in the Summer. For these reasons we have rated New Place as a Top Summer Wedding Venue and a Top Winter Wedding Venue. Old Thorns is a top golf club near Liphook, Hampshire with attached hotel and two fabulous wedding suites. The larger suite can cater for a substantial number of guests with a large bar, large dance floor and great decor. There is a modest garden attached to it for outside wedding photography if appropriate. The more intimate suite over looks the actual golf course, has a lovely view and its own attached bar and patio that backs onto the golf course. It has its own intimate bar and a separate room for the ceremony and the reception. The dance floor for the evening is in the same room as the ceremony earlier. Which ever option you choose for your wedding, you will have the opportunity to ride in a golf buggy with your photography to one or two of the beauty spots on the course for wedding portraits (weather permitting). The foyer of the hotel is a very striking place for wedding photography and is available which ever you option you choose. The foyer is a fascinating combination of modern decor in traditional architecture. It has modern steel and glass stair case and modern sport lights and a wall covered with black and white photographs of Hollywood stars but the architecture itself is one of a renovated barn. Very pleasing and in complete contrast to the elegance and intimacy of the wedding rooms themselves. The golf course itself has some glorious views and if you choose the smaller of the two wedding suites which backs onto the gold course it is likely you’ll be able to make the most of a sunset if you’re lucky enough to have one. There is ample parking close to the hotel, the staff are fantastic, the decor is awesome and the views around the golf course are fabulous. We definitely recommend that you have a look at this venue if you like the idea of a golf/hotel wedding venue. 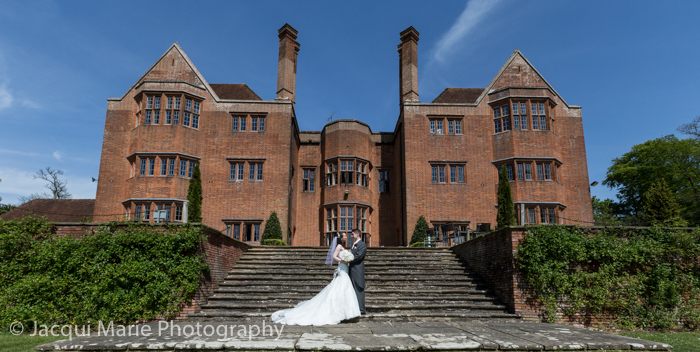 Elvetham is an amazing wedding venue not far from Hook in Hampshire. It’s long tree-lined drive builds great expectation and the venue doesn’t disappoint. Hundreds of years ago Elvetham was used by Royalty and you can see why. Everything both inside and out is grand and elegant and beautifully proportioned. From a photographic point of view you could spend a week there and still have opportunities you hadn’t exploited. The grounds are huge. There are lawns and hedged walkways and walls with gates and trees and water features and meandering roads. There is a fabulous covered entrance to the main building which has great natural light and gorgeous architectural features. The inside is exquisite and spacious and oozing with historic culture. The rooms are have high ceiling and the decor is gorgeous. The ceremony room, the reception room and the disco/dance room are all different rooms and adorned with gorgeous fireplaces, windows, book-cases etc. There is a lovely staircase which leads to the upstairs room, over looking the gorgeous gardens at the back, which is used for bridal prep. It is spacious with fabulous window light and an outstanding view over the garden. A great way for any bride to begin her wedding day. The grounds and interior have a huge number of portrait opportunities. When it comes to group shots there are many outside options. If the weather isn’t ideal for outside group shots then, because each of the three wedding functions (ceremony, reception and disco) are in different rooms, it is easy for the staff to accommodate group shots indoors in one of the beautifully decorated rooms. When we have been there the staff have been second to none in their professionalism, resourcefulness and willingness to please. It is for all these reasons we have rated The Elvetham as both a Top Summer Wedding Venue and a Top Winter Wedding Venue. 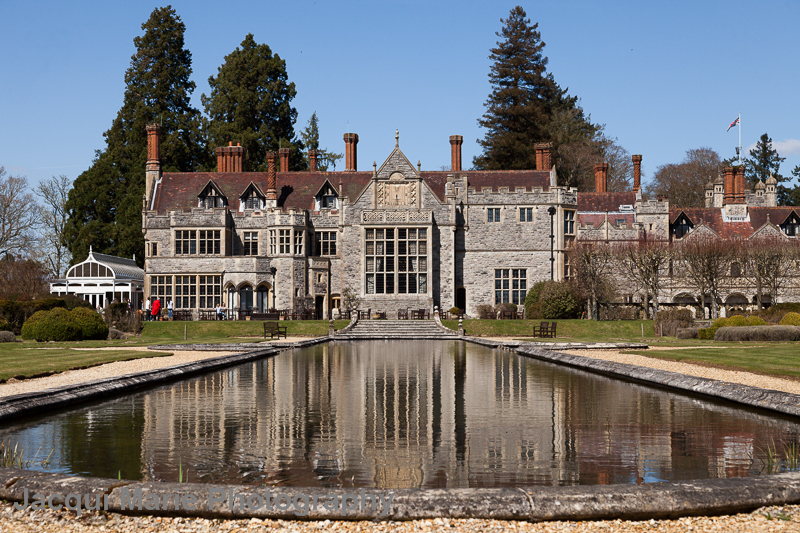 Rhinefield House has outstandingly beautiful exteriors, interiors and grounds. The interiors are not only beautiful but spacious making Rhinefield an excellent choice for a Winter Wedding. 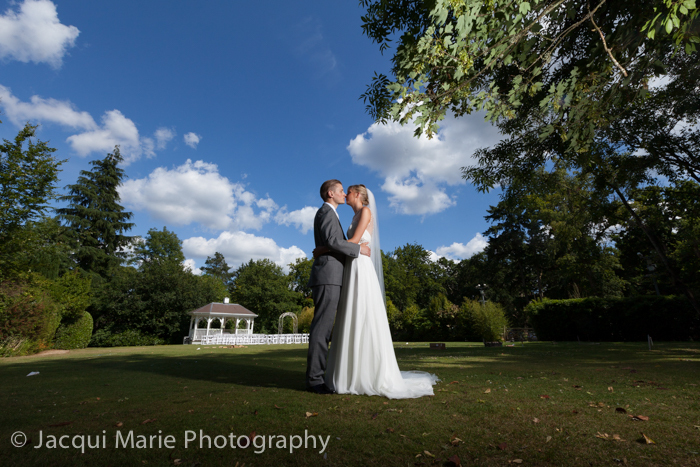 The beauty of the grounds also make Rhinefield a top venue for Summer weddings. The grounds are substantial and are beautifully designed. They look fantastic both at the front and at the back of the hotel and include three ponds, each with water features, a gazebo, a maze, ornamental steps, a patio and beautifully kept lawns. It is a beautiful drive through the New Forest in order to get to Rhinefield, then a long drive through trees until you eventually see the stunning architecture of Rhinefield at the end of the drive. This is a wonderful way to arrive. Rhinefield only do one wedding at a time which makes it feel as though it is your’s for the day. 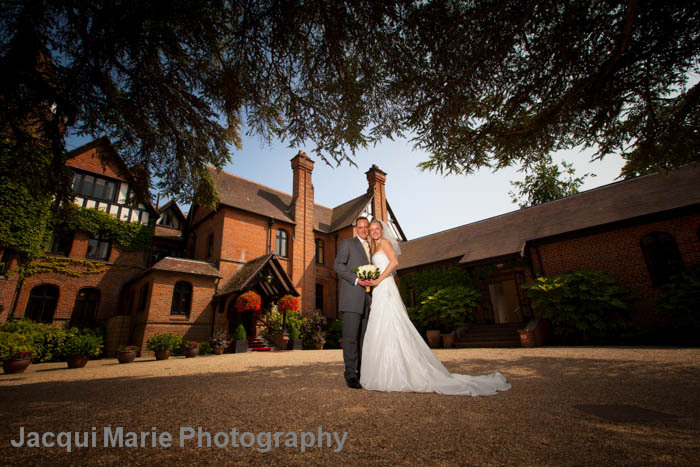 If you are having your ceremony at Rhinefield as well as your reception, they use the fabulous Hall for both. It has a huge window at the end, it has a high ceiling with candelabras, wood panelling and a fabulous stone fireplace. [UPDATE: 1 May 2017] Rhinefield now offer outside ceremonies if the weather permits. Between the ceremony and reception the room will need to be turned round by the staff so you and your guests are moved into a spacious adjoining room which is the same room that is used for the disco in the evening and includes a bar. In the Summer, your guests can spill out from this room onto the patio and grounds at the rear. Some couples hire a singer to entertain the guests whilst having drinks on the patio and sometimes they put garden games on the lawn. The Langstone Hotel has three wedding suites. One is upstairs with a panoramic view of Chichester harbour. The other two wedding suites are beautifully decorated with chandeliers and big wall mirrors giving a lovely ambience. The main hotel bar area is photogenic and great for reportage wedding photography. There are several outdoor locations suitable for formal group shots. If the weather has been fine and grass is not muddy there is patch of grass out the back of the hotel which can have the group shots with trees in the background or, if the tide is in and the sky in interesting, the creek can be a good background. If the weather has been bad, the Hotel Entrance can be used for group shots, it is quite well sheltered there and waiting guests can be in the foyer out of the weather. There are some wonderful portrait opportunities if the weather and tide are compatible with the timing of your wedding. These include shots between the trees opposite the hotel car park with Chichester harbour as the back drop. Also, the creek makes a great backdrop, especially if the tide is in and the sky is blue and the wind not too great. One of the nicest things about the hotel (from a photographer’s point of view) is the likelihood of getting a sunset. There is a clear line across Chichester Harbour towards the birdge to the horizon. Ideally the tide would be in but even if it isn’t the mud flats are usually still wet and reflections are still effective. Of course weather there will be a sunset or not is a matter of chance but if there is one, The Langstone Hotel is a great place to make the most of it. The Langstone Hotel is easy to get to being only a few minutes drive from the main A27 at Havant and has close by car parking. Since The Langstone Hotel has such lovely and varied interiors, it is an obvious candidate for Winter weddings and at Christmas the decorations help to create a cosy atmosphere. 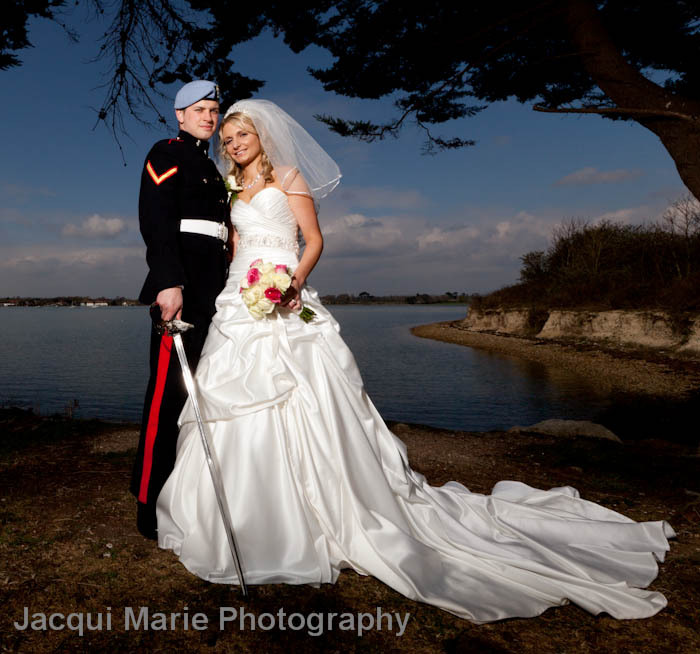 For this reason we have rated The Langstone Hotel as being a Top Winter Wedding Venue. 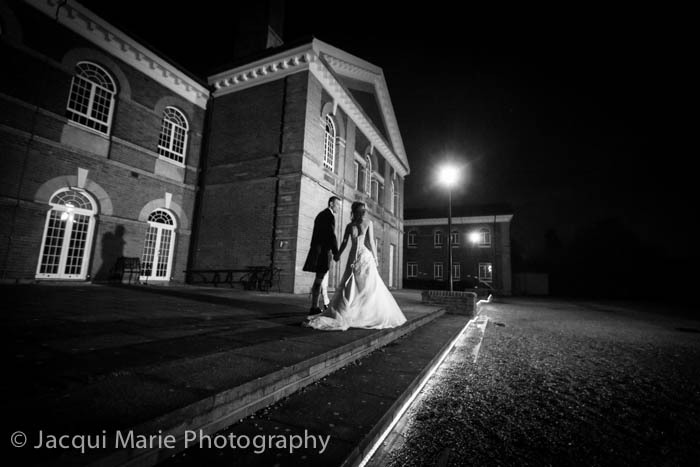 If you have the weather to get the best out of the outside photographic opportunities then the photographs you could get from this venue are as good or better than any other venue in the area. 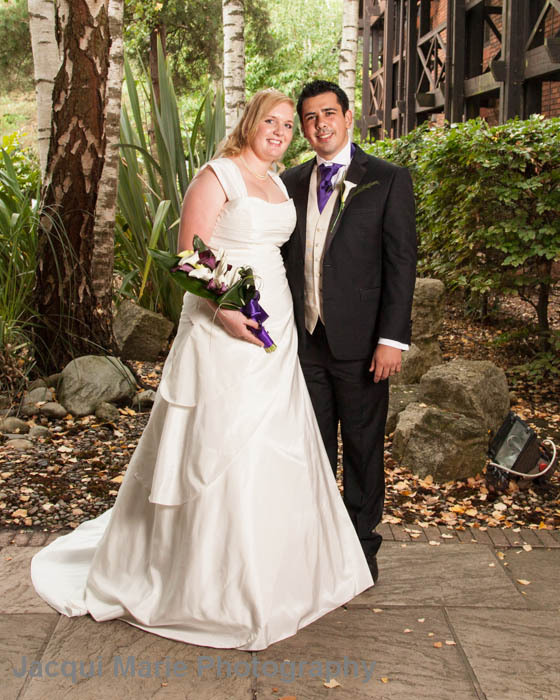 It is for that reason that we have rated The Langstone Hotel as being a Top Summer Wedding Venue. The staff have always been fantastic and easy to work with. Whenever we have been there the food has been very good. The Solent Hotel is a large five star hotel with some great interiors for photography and a choice of three different wedding suites suitable for small, medium and large weddings. In the foyer there is a wood panelled fire place area, wood banistered staircase and chandelier. Great opportunities there for group shots as well as portraits making this a top winter wedding venue. The entrance is a covered walk way which usually has a red carpet laid out for weddings. The red carpet goes all the way to the end over the wood beamed gable roof where the wedding cars can stop for arrivals. The entrance is a great place for arrivals photographs with the geometry of the roof beams, low walls and red carpet. The shelter that it provides makes such photographs possible even in bad weather. There is a pleasant and sizeable covered patio at the back of the hotel and a small garden. The large and medium sized wedding suites also have their own bars and ante rooms where guests can mingle and relax whilst the main room is being turned round. We have always found the staff to be resourceful and helpful and the resident DJ comes recommended. 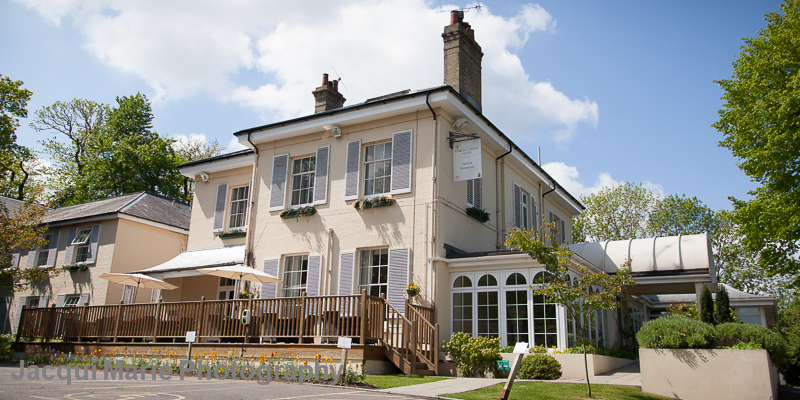 The Solent Hotel is a large wedding venue with great interiors, easy access to the M27 junction 9 and plenty of parking. We rate The Solent Hotel as being a Top Winter Wedding Venue.